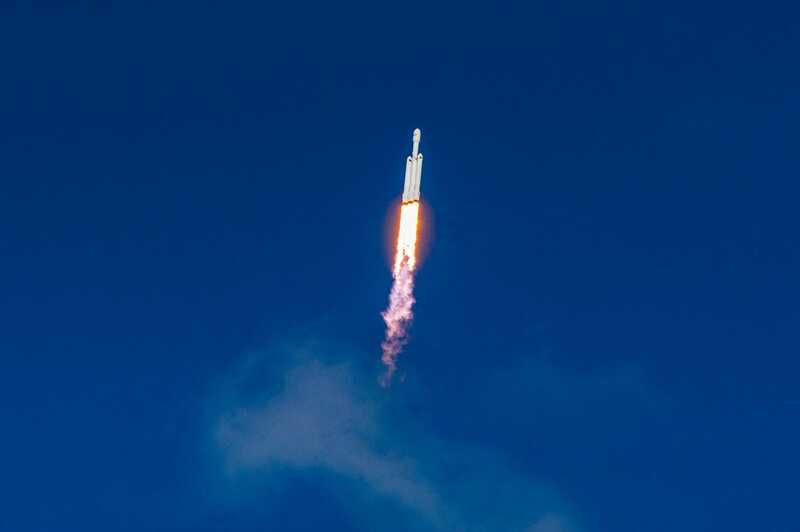 There is nothing like seeing a rocket launch toward space in person, and the first flight of SpaceX’s three-booster Falcon Heavy system was no exception. As a space reporter, I’ve see a handful of space shuttles and a Mars robot leave Earth, but Falcon Heavy’s maiden flight blew them all away. SpaceX gave me access to cover its demonstration mission, which successfully launched company founder Elon Musk’s red Tesla Roadster toward Mars with a spacesuit-clad “Starman” dummy and three cameras inside. Here’s what it was like to witness the spectacle of Falcon Heavy from Kennedy Space Center, including a post-launch press conference with Musk. Falcon Heavy fever was on display as I drove toward the space center. 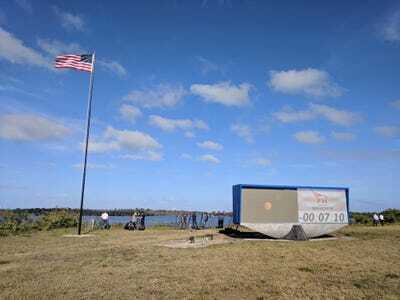 Some people were camping out on a causeway with good visibility of the launch pad more than a day ahead. Just outside the gates, I drove past this massive building: a 750,000-square-foot factory to build reusable rockets for Blue Origin, the aerospace company founded by Amazon billionaire Jeff Bezos. Blue Origin is likely to become a major competitor of SpaceX. I asked for permission to peek inside, but Blue Origin representatives declined. 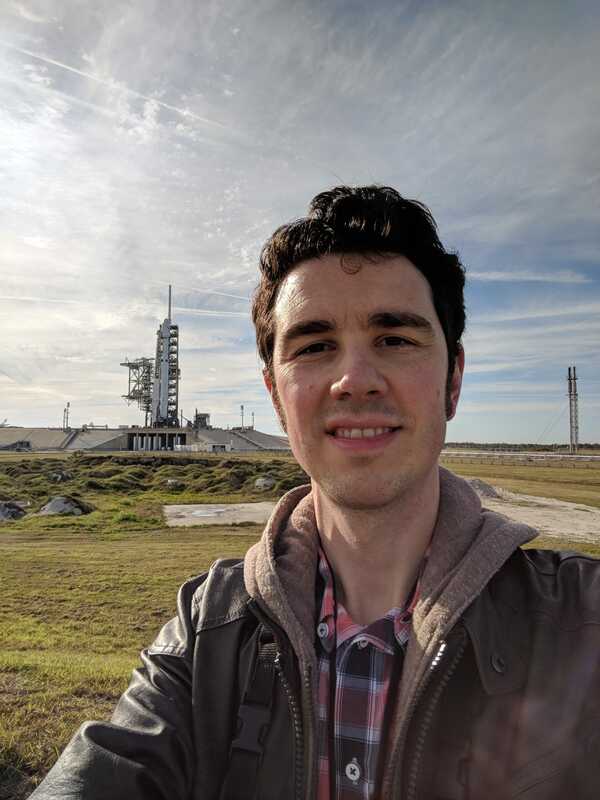 I arrived in time to catch a ride to see Falcon Heavy on its launchpad. 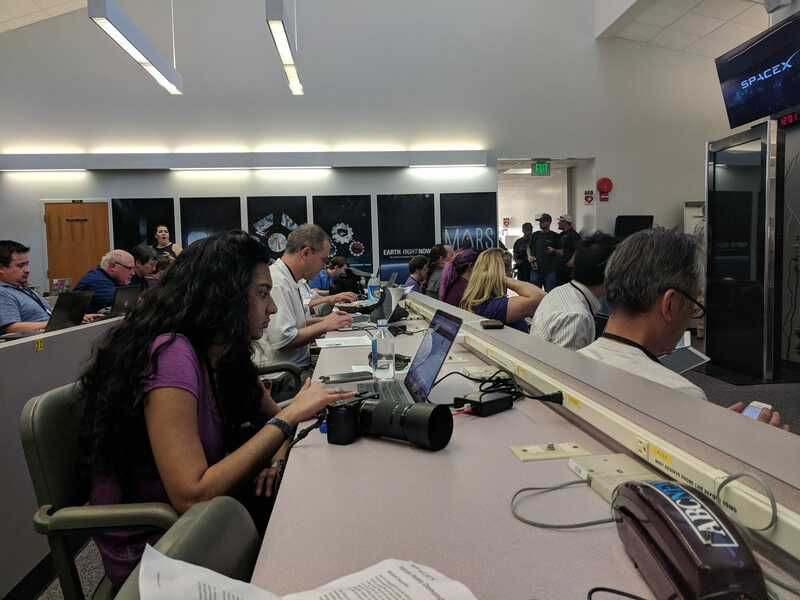 But NASA takes launchpad security very seriously — everyone who wanted to go had to set their gear on the pavement, take 10 steps back, and let a police dog sniff for weapons and explosives. 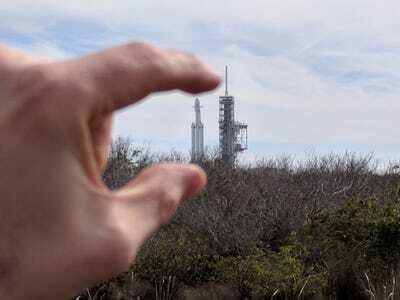 At first, Falcon Heavy — which is 230 feet tall — looked tiny in the distance. But as we got closer to the pad, the scale of the rocket became apparent. It’s stunning to see what people are capable of when they challenge themselves. 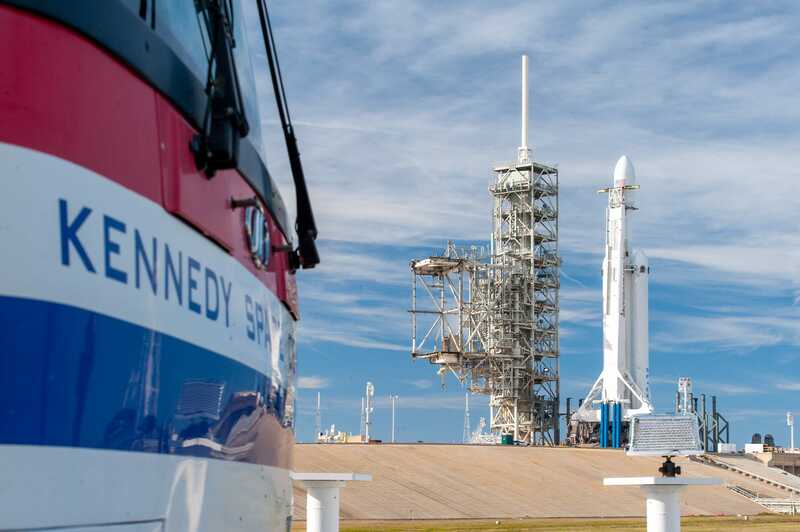 Falcon Heavy was sitting on Launchpad 39A — the same place from which NASA launched Apollo astronauts to the moon. 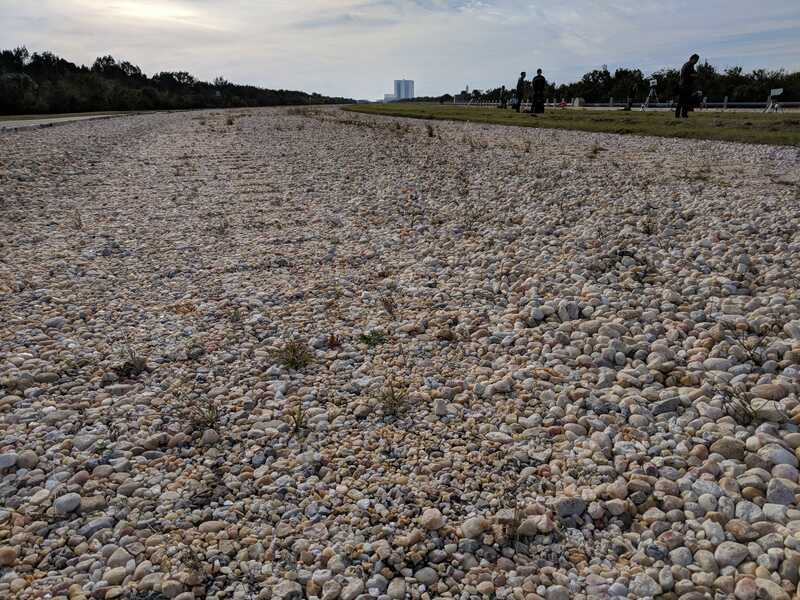 Nearby was the Saturn Causeway: a wide path of gravel that NASA used to inch its Saturn V rockets and space shuttles toward the launchpad. 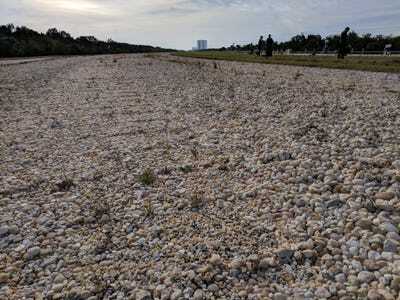 You can see ridges left by the huge treads of a crawling platform, which is still used by NASA today. From that path, we got a spectacular view of Falcon Heavy on the pad. We weren’t allowed to get closer, however, until Musk finished his own visit to the rocket. 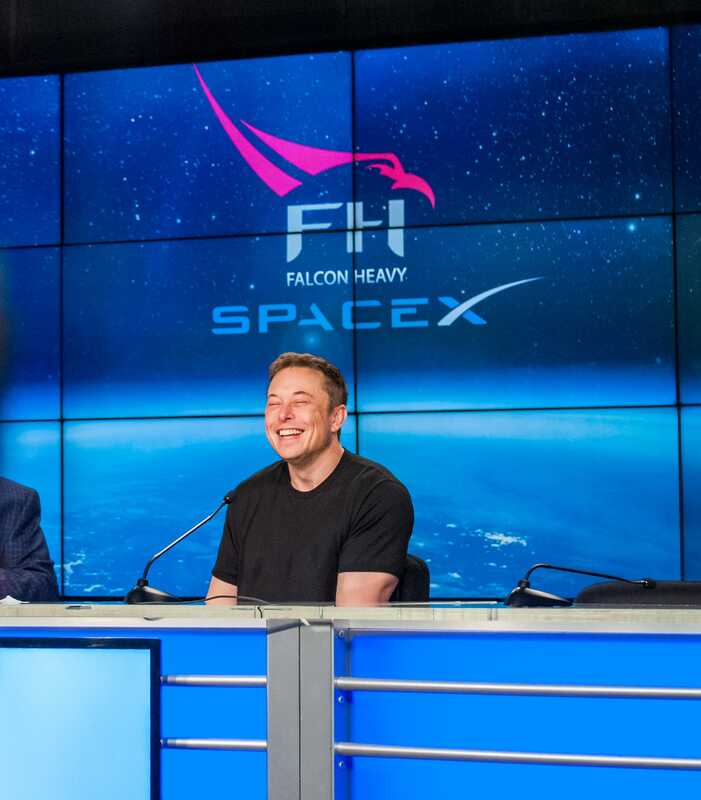 “I was looking at Falcon Heavy and thinking, ‘it’s a bit small,'” Musk told reporters on Tuesday. Once Musk departed, we pulled onto an earthen mound meant to deflect the force of launch (or any explosive accidents). The view was incredible. 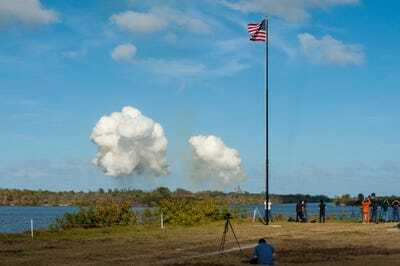 Take a look around Launchpad 39A by clicking, dragging, and zooming in on this 360-degree photo. 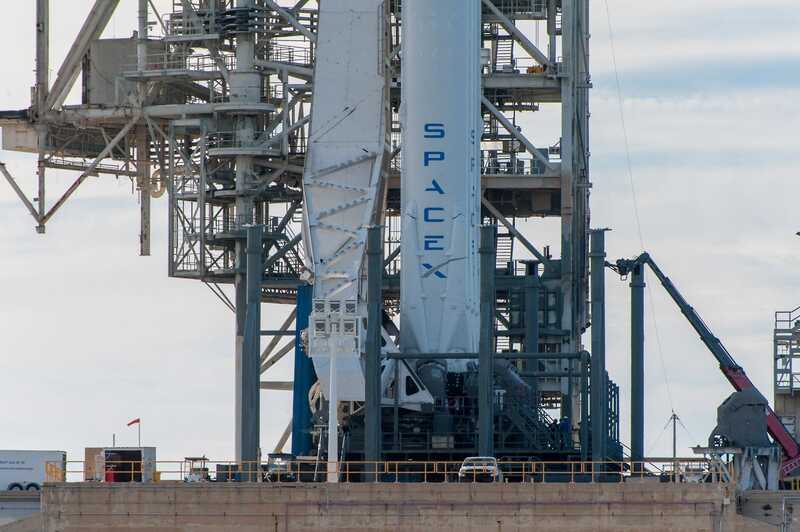 … And the point where its side boosters attached to the core booster. 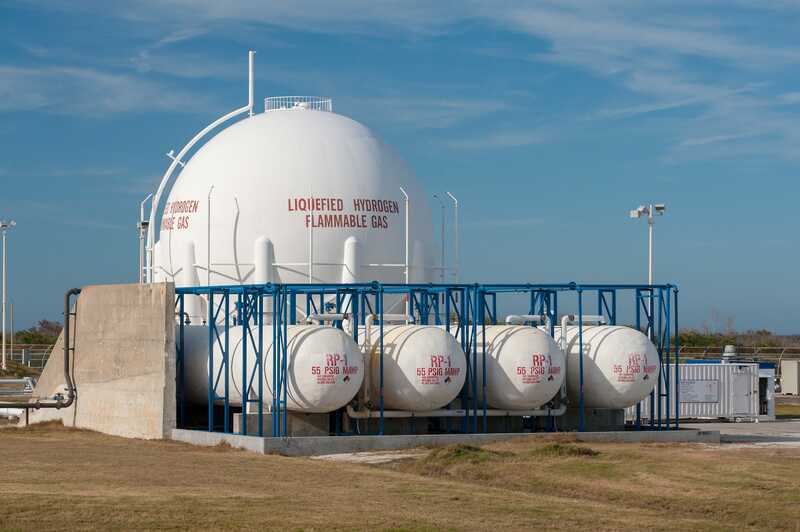 Nearby were huge tanks filled with RP-1, a type of rocket-grade kerosene that SpaceX uses to fuel its Falcon 9 and Falcon Heavy rockets. I rarely take selfies, but I couldn’t pass up this opportunity. With daylight fading, it was time to head back. The next day we’d find out if weather or technical problems would scrub the launch. 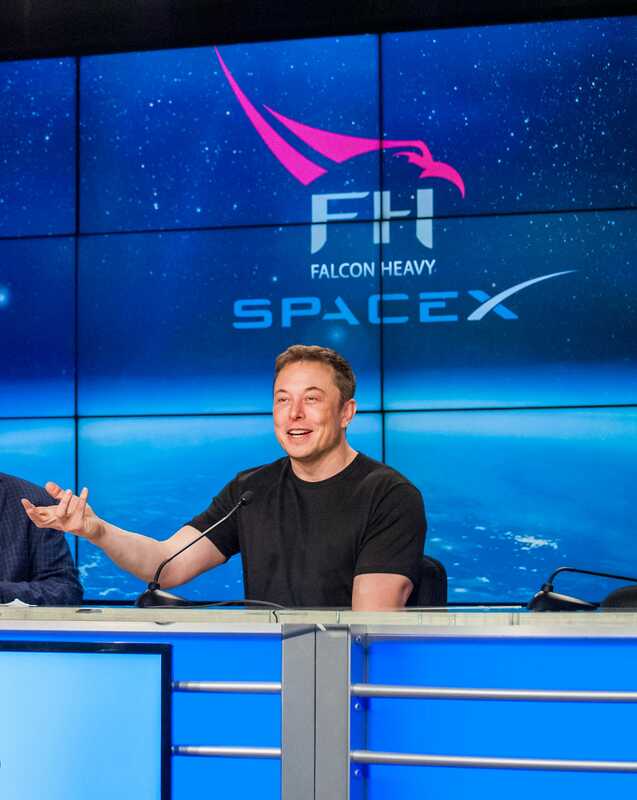 I was anxious the rocket might fail; Musk had repeatedly said there was a good chance Falcon Heavy could blow up. When I arrived at the press site on Tuesday morning, I holed up at a desk to write and keep an eye out for any delays. At this point, the situation looked good — the clock was counting down to launch. Dave Mosher/Business InsiderSome of the equipment at the press site was left ny news organisations after the last space shuttle launch in 2011 and never removed. It was both sentimental and sad to see. 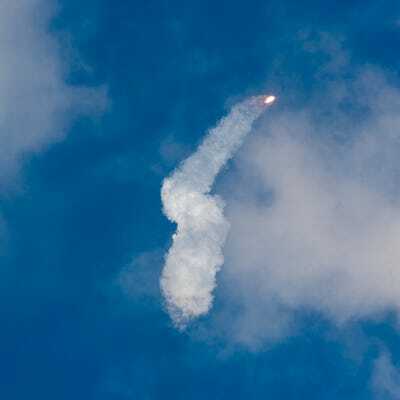 But things got dicey with about two hours left in the countdown: Weather forecasters reported strong wind shear — a type of high-altitude wind that can blow a rocket off-course and lead to failure. SpaceX had until 4 p.m. 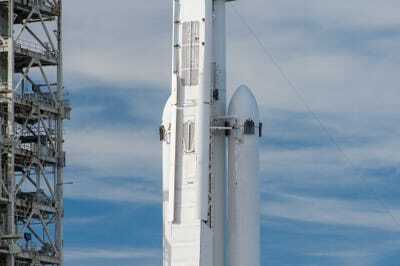 ET to launch its rocket, yet delay after delay kept piling on. Everyone was expecting a scrub. 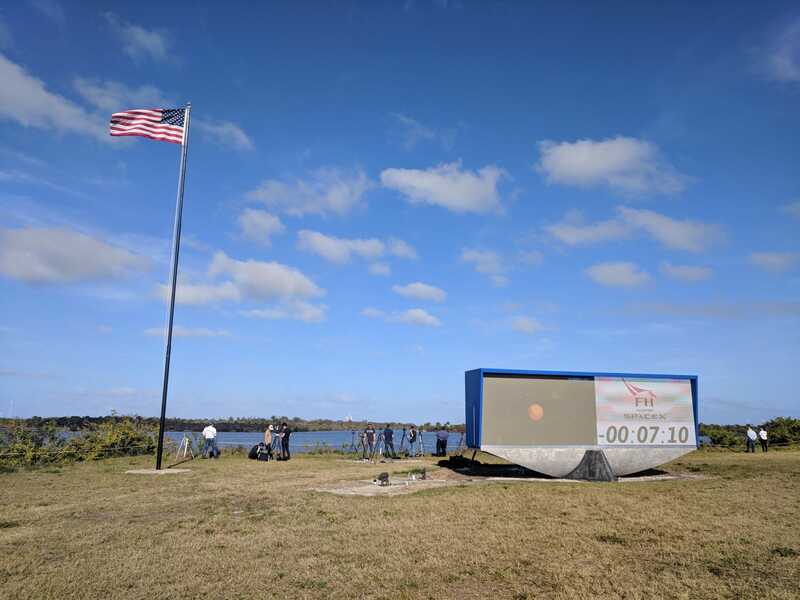 But the high-altitude winds finally calmed, the clock began counting down again, and SpaceX gunned for a launch at 3:45 p.m. ET. 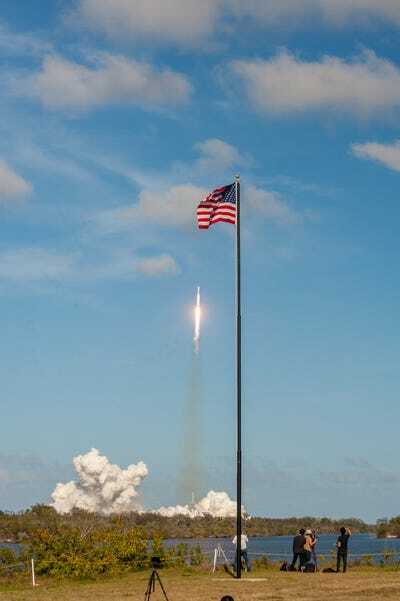 When the clock struck zero, cheering and shouting erupted on the lawn and rocket exhaust burst from the launchpad’s flame trench. Falcon Heavy’s 27 rocket engines had ignited! The rocket climbed upward, shooting out the brightest flame I’d ever seen. 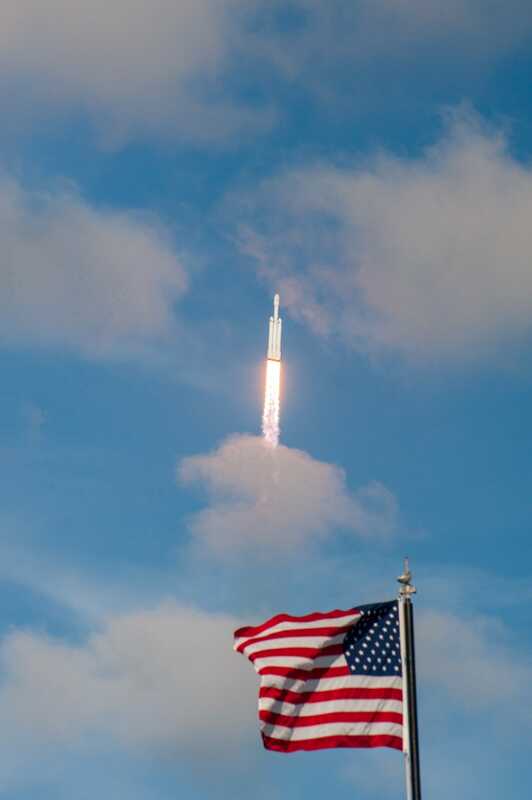 It looked almost as if a miniature sun was chasing Falcon Heavy into the sky. The roar of the rocket’s engines was so thunderous and percussive, you could feel the sounds rattle deep in your chest. … Until the only trace of its launch were two huge puffs of smoke. 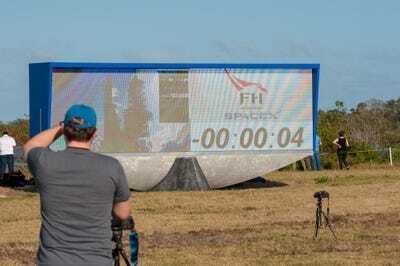 This clip shows Falcon Heavy’s launch sped up 400%. It was incredible, but I knew the show wasn’t over. A couple minutes into Falcon Heavy’s flight, the rocket’s two reusable side boosters popped off and careened back to Earth at supersonic speeds. SpaceX/YouTubeSpaceX projected its live webcast of the launch on the press site’s countdown clock. 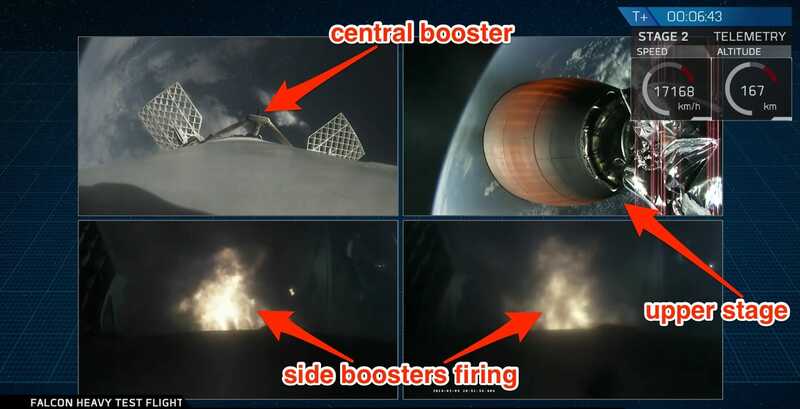 I didn’t see the side boosters until about six and a half minutes after launch. That’s when they fired up their engines to manoeuvre to a landing about nine miles from where I was standing. Each side booster is about 16 stories tall, so my jaw dropped when I saw them rocketing toward the ground. But what completely stunned me were two sets of triple sonic booms they caused — I shouted in surprise when the shockwave reached the press site. 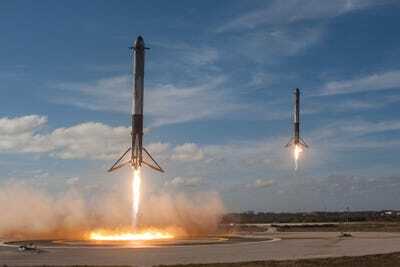 SpaceX/Flickr (public domain)A view from a remote camera set up by SpaceX showed the two side boosters landing together at Cape Canaveral Air Force Station. The central booster crashed into the ocean at 300 miles per hour. After milling around outside, stupefied by what I’d seen and heard, I went inside and waited for Elon Musk. 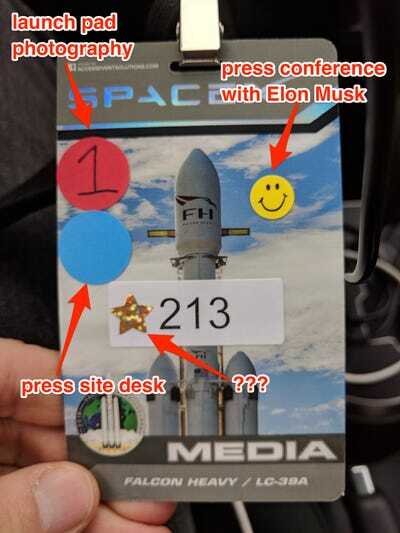 Stickers on my press badge represented my access to various events, and the smiley face allowed me into the press conference. Dave Mosher/Business InsiderOnly four pieces of flair? Musk was clearly thrilled with the success of Falcon Heavy’s first flight. 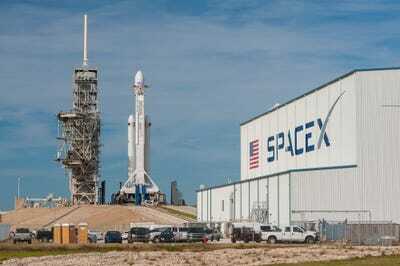 He said the total development of the system, which lasted more than five years, had cost SpaceX more than $US500 million. When it comes to SpaceX’s future plans, Musk said, the company is working on an even larger reusable launch system called the “Big F***ing Rocket,” which is designed to help colonize Mars. 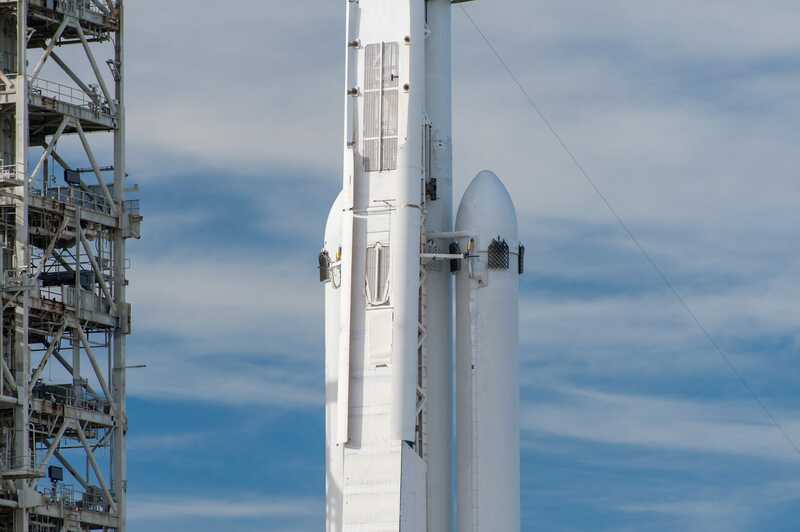 Current plans call for a 158-foot-tall reusable spaceship set on top of a super-size reusable booster. 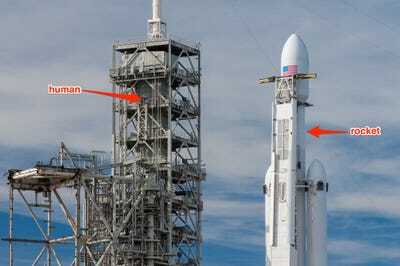 Together, the system may stand nearly 350 feet high (130 feet taller than Falcon Heavy, and 45 feet taller than the Statue of Liberty). By many measures, Falcon Heavy was a standard rocket launch. But in other important ways, it was much more. It sent up a wild payload — Musk’s own Tesla Roadster with a spacesuit-wearing dummy — and signalled a major coming disruption to a high-priced launch industry. 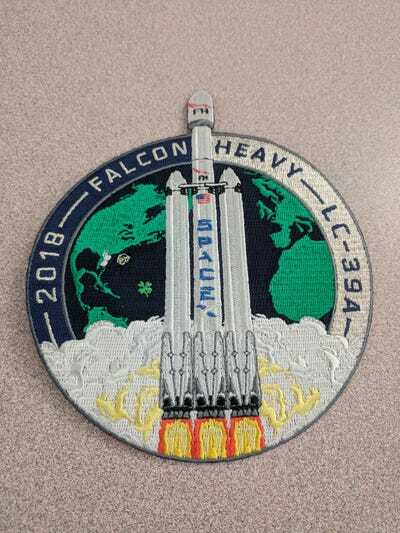 Dave Mosher/Business InsiderThe mission patch for the Falcon Heavy Demonstration mission. 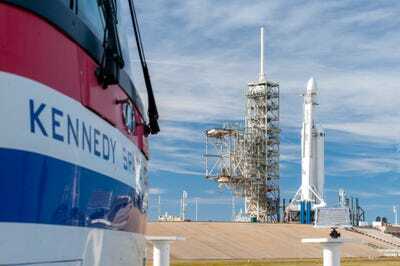 Each Falcon Heavy launch is projected to cost about $US90 million – less than one-third the price of similarly capable rockets, which are projected to balloon to $US1 billion per launch in the coming years. 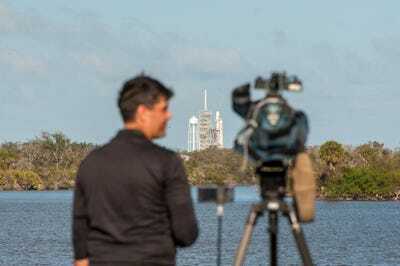 As I left Kennedy Space Center, it dawned on me that I’d just seen spaceflight history being made. 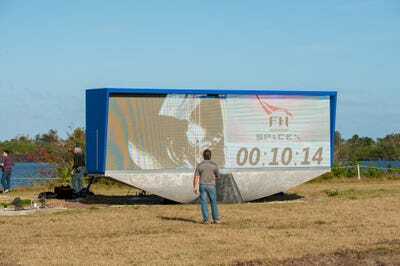 But only time will tell just how momentous the launch will be. 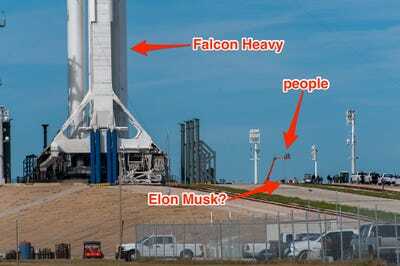 The true test is for SpaceX to prove it can launch more Falcon Heavies — often, consistently, and safely.